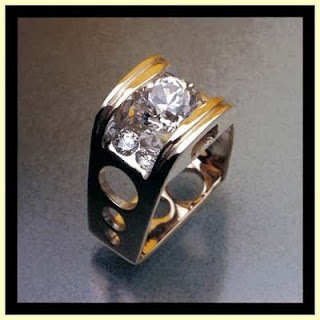 Daniel Icaza Artist & Metalsmith: Make Me a Ring! I have been commissioned to make a few rings recently and thought I would share a bit of the process with you. One commission is for a "non-traditional" graduation ring. The other is for a collector who wants a special piece made to showcase an inherited stone that has much sentimental value. Ring designed by: Roberto Vengoechea, Used as inspiration for a commissioned ring. Usually this process begins with the client bringing me some sort of picture of a piece that they like and want me to re-create (like the ring above). Now there are many aspects to this that I love and a few that I don't love so much. I love the fact that people seek for me to make something for them. But I don't want to make some thing that A) has already been made and B) is the artistic design/work of another artist. In these cases I tell the client that I can make them something similar but not the exact same piece. If the client agrees, I then begin making some designs and prototypes using the original "piece" they came to me with as inspiration. This I really like! Occasionally clients come to me with very interesting pieces made by artists/designers I was not previously aware of. I enjoy taking these jobs as opportunities to broaden my knowledge and learn about these artists/designers and the techniques they use to see how I might apply it to my own work. I also really enjoy the liberty of taking a design which maybe very traditional and making my own version of it. Or taking an idea that a client came to me with and transforming it into something they had never envisioned before. Another lovely aspect to making the prototype/s is not only having a physical representation of what the client can expect. But also the fact that Kaylee and I usually get to keep the prototypes, so our personal collection of lovely treasures grows quite rapidly. Neither of these commissions have been completed yet, but I will be able to share some images of the final pieces once the designs are settled upon. In the mean time I am sure I will have a lot more news to share very soon so I hope you come back to see what happens next.